The Historical Society is taking its design plans on the road to get public input. It wants to tear down the current visitors center, add an outdoor amphitheater, and rehab one of the old cavalry barracks to make an expanded visitor center and event space. It wants to add walking paths along the bluff so people can see the river better. It wants to improve signage and paths so it is easier for people to find their way around. I attended one of MHS’s open houses Thursday at Bracket Park in Minneapolis. I found the presentation promising. For my money, the most critical decisions will be how MHS upgrades the Fort’s historical interpretation. At this point, there are not a lot of specifics. The Historical Society said it going to take its time to get public input, including meetings with the state’s Native American communities. There is still plenty of time to make comments. Other Coalition sites include Little Rock Central High School National Historic Site, Gettysburg Seminary Ridge, and Carcel de Carabanchel in Spain, a notorious prison under Generalismo Fransisco Franco’s rule. That is significant company to keep, and a strong indication of a commitment that we need to learn from the huge mistakes of our past. Daniel Spock, Director of the History Center Museum, is leading the team looking at revisioning the Fort. He said there is a lot the Historical Society could do to expand on its membership with the International Coalition of Sites of Conscience. The Fort, “is a microcosm for some of the most important issues and conflicts in American history,” he said. 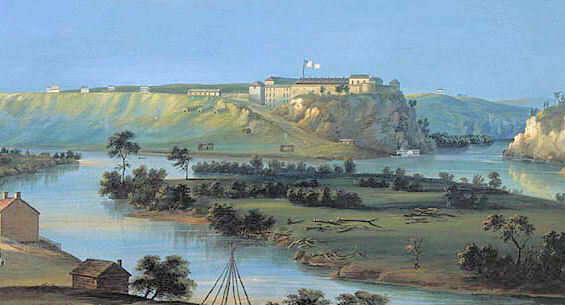 Dakota Homeland: The Fort sits at the confluence of the Mississippi and Minnesota rivers — what the Dakota call Bdote. It is the site of the Dakota people’s origin story and their traditional homeland. The site has been occupied for 8,000 years. The Fort also is the site of the Dakota internment camp of 1862-63, holding 1,600 women, children and elders during the bitter winter following the Dakota-U.S. War. Many died there. Westward expansion: The Fort represents westward expansion, a place soldiers mustered for national and global conflicts. Slavery: Dred and Harriet Scott were among the slaves who lived at the Fort, and the place from which they fought for their freedom. Trade: Looking at the Mississippi as a key trade artery, from prehistoric times to today. Military Intelligence: During World War II, Japanese Americans (many who had spent time in internment camps) worked at the Fort to gather intelligence to end the war. I have not been to the Fort in many years, but Pfannenstiel said they have added exhibits, from Dred and Harriet Scott to information on treaties. Those kind of stories “will be a huge part of our future programming,” he said. The direction seems positive. Now comes the challenging work for MHS to engage in an inclusive process that gives life to those words. MPR ran a story yesterday headlined: White Earth tribal chair Vizenor explains why she resigned. In short, Vizenor said: “It was inevitable. … The board was going to vote me out. I wanted to resign on my own terms.” MRP said Vizenor plans to run for secretary-treasurer of White Earth in two years. In the meantime, she plans to write a book on tribal government.